Need a quick meal that’s BURSTING at the seams with flavour? 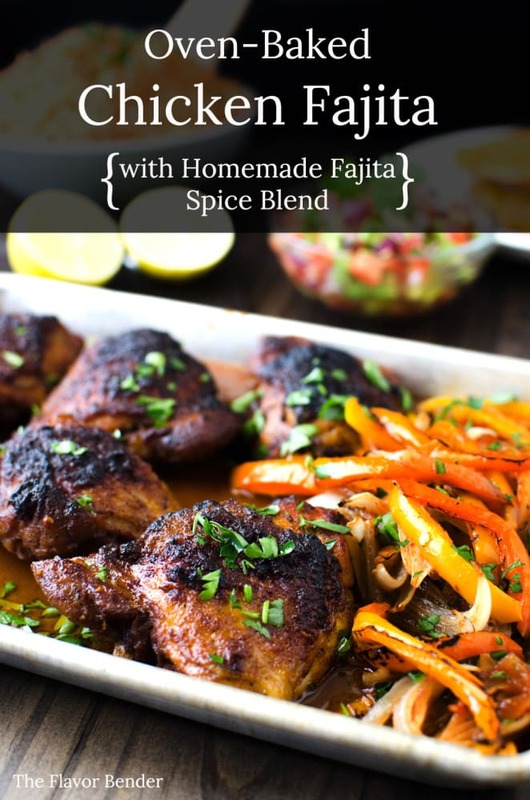 This Easy Oven-baked Chicken Fajita with my homemade spice blend will soon be your family favourite. Guaranteed! The best thing about food blogging for me has always been the feedback. Every time I hear from someone that they tried one of my recipes and that it turned out well for them, it makes my day. And completes that process of creation for me. Last year I made some incredible Spicy Fajita Steak Quesadillas and even though that post didn’t exactly catch fire, I’ve gotten some amazing compliments from people around the world who have tried it. Especially that Spicy Fajita seasoning. I’ve gotten a lot of emails from readers who absolutely loved that seasoning and you guys have no idea how deliriously happy that makes me! As it happens, it’s one of our favourites too and Mr K makes a request for it quite regularly. While it was delicious with steak, it works just as well with chicken too! 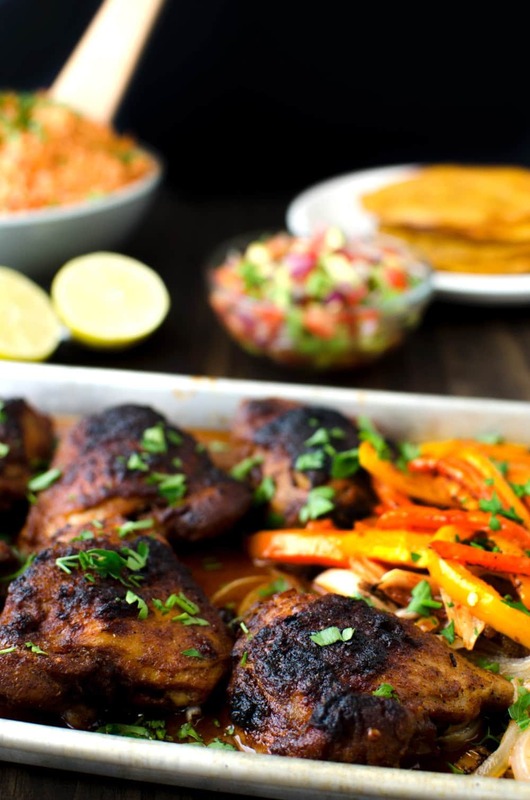 So when I want to make a quick and easy dinner that’s loaded with juicy flavour, my Fajita seasoning for Oven-baked Chicken Fajita is one of my go-to recipes. So how easy is it? You make the spice mix. Marinate the chicken. Place the marinated chicken pieces on a roasting tray with all of the marinade. Then roast, and throw in the peppers and onions towards the end of roasting. The result? Chicken Fajita at its most flavourful. Mix together the ingredients for the Fajita seasoning. You can make multiple batches of this and store in an air-tight bottle. Mix the contents of the Fajita seasoning with all the ingredients of the marinade (except the chicken) until well combined. Pat dry chicken pieces and place them in a dish (that you can keep in the fridge). 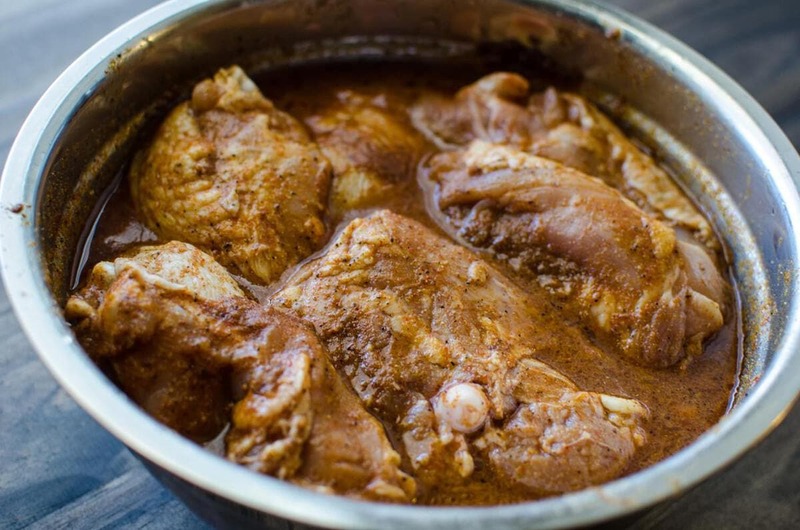 Pour the marinade over the chicken pieces and use clean hands to mix the chicken well with the marinade, making sure all the chicken pieces are coated well. Leave for about 2-3 hours (up to 24 hours) in the fridge to marinate. Preheat oven to 350°F / 180°C. Prepare a roasting pan or tray by lining it with foil (I did not actually do this, but it's a lot easier to clean) and lightly coat the surface with oil. Place the marinated chicken pieces on the tray (skin side up). Pour remaining marinade on top and place the tray in the middle of the oven. Bake for about 30 minutes, and baste with the juices in the tray halfway through (if the skin is starting to get too dark, cover it with some foil). After 30 minutes, transfer the jalapeno (if using), sliced onions and bell peppers to the tray and pour some of the juices in the tray on top of these and roast for a further 15 -20 minutes. Let the chicken pieces rest for a few minutes and serve with some cooked white rice (or Spanish rice), tortillas, salsa and Aji sauce (recipe for Aji sauce coming soon). NOTE - You can grill or BBQ this chicken just as easily as well. Just use the marinade to baste the chicken pieces while they are being grilled so that you retain that wonderful moisture. This may seem like a lot of marinade for chicken, but it works. It keeps the chicken moist, tender and flavourful. Which also means you can shred the chicken easily (and those pieces will then soak up the sauce, yum!) and use it in quesadillas, tostadas, burritos, tacos, whatever! OR have the whole piece with Spanish rice OR with some roasted veggies. We always make a feast out of these. Here, I made some creamy, refreshing Avocado salsa, and some spicy, tangy Aji sauce. It was a brilliant combination. And it goes really well with the fruity and spicy Chicken Fajitas. To top it off, I even made some Spanish rice and tostadas. You know, just in case the feast wasn’t big enough. There were plenty of leftovers for next day of course! The recipe for the Aji sauce is coming soon on the blog – so stay tuned for that. You could also sign up for free updates from me, so that you don’t miss out. However you decide to have this, one thing is guaranteed. Incredible flavour. A little spicy, a little sweet, a little fruity, and lots and lots of flavour. You can adjust the level of heat in the recipe by decreasing the amount of cayenne pepper you use as well. 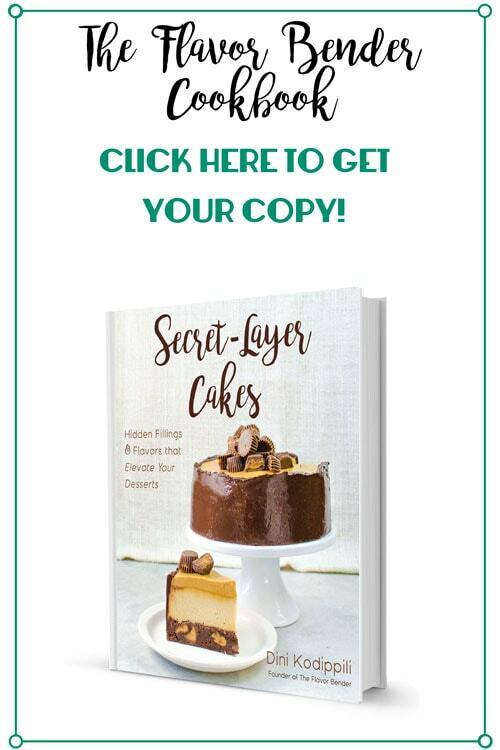 If you liked this recipe don’t forget to subscribe for new (and free) recipes and updates by entering your email address below (and get all these recipes delivered straight to your inbox), so you don’t miss out on a thing. You can find me on FACEBOOK, TWITTER, INSTAGRAM, PINTEREST and GOOGLE-PLUS too. 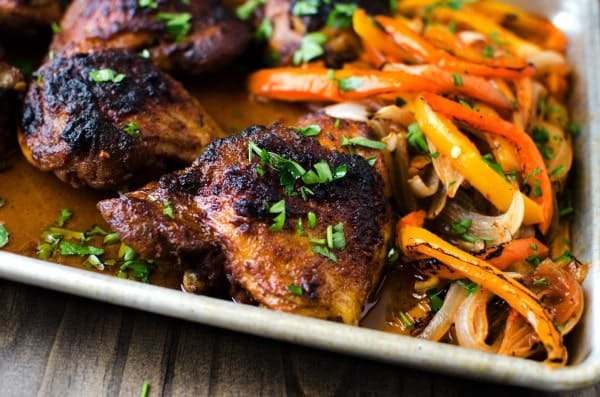 This dish looks absolutely mouthwatering, I love a good chicken dish, we eat so much chicken in our house. thank you for sharing this one! Great photos! Love that you can get all the wonderful flavors of a fajita in a convenient, oven-baked recipe. Looks delicious. 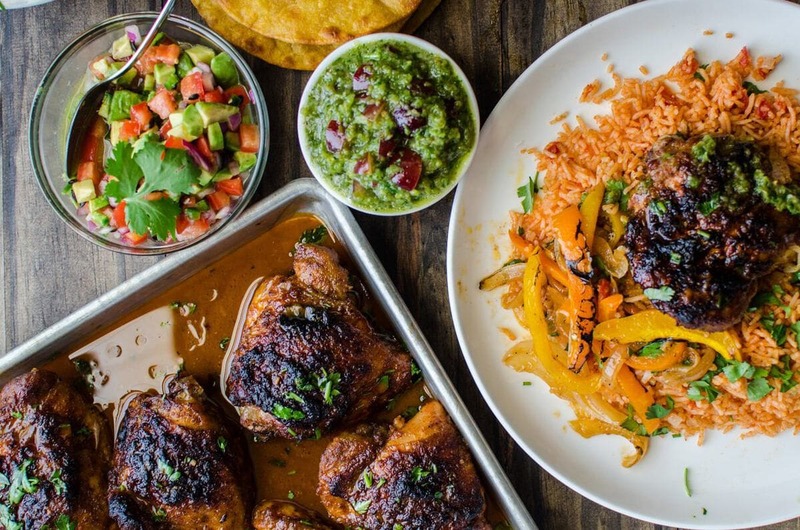 Love the use of all the spices in this recipe. 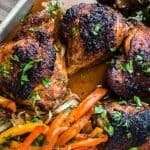 And that char on the chicken is beautiful, pinned! This dish looks absolutely phenomenal! 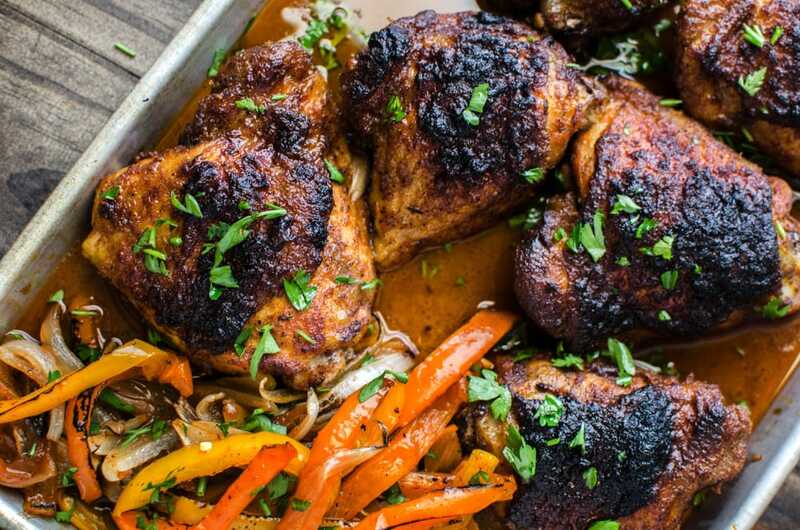 Moist chicken thighs are definitely the way to go! Beautiful pics! Wow, this is amazing! Fajitas are one of our go-to dinners, love that this is cooked in the oven! I am always always looking for new things to make with chicken. It can get so boring doing the same old stuff! Thanks for this great inspiration. Sounds like a super flavourful recipe. Love fajitas anyway I can get them–the fact that this is made in oven for an easier variation–LOVE! It will be making an appearance at my house soon! I know exactly what you mean about how great it is to get recipe feed back from readers. Here is hoping lots of people make this delicious looking recipe. Yummmy. And easy!! A great feast. That avocado salsa looks great too!! This looks so good, I love lots of cayenne pepper too. The rice looks really delicious as well! Thank you Abida! 🙂 We are spicy food fiends too! !